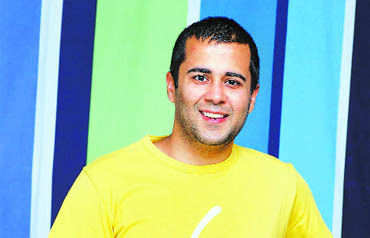 WRITER Chetan Bhagat, whose book Five Point Someone is being made into a film titled Three Idiots by the acclaimed director Rajkumar Hirani, said he was not involved in writing the film’s script, but he liked it. "The director took my book as the base but he has changed it according to his requirements. He took permission from me before taking my story, but has not involved me in making it into the final script. But, he has shown me the final script and I have liked it too," Chetan said. Hirani’s film stars superstar Aamir Khan, along with Sharman Joshi, R. Madhavan and Kareena Kapoor and went on floors recently. But, for Hello, which is an adaptation of his book One Night@The Call Centre, Chetan said he had been actively involved in the scripting of the movie. Chetan said, "I have written the script for the film and it has really come out well. The changes that were needed to make turn into a good film were made by me with inputs from the director." Hello, which stars Khan brothers — Salman, Sohail and Arbaaz, along with Katrina Kaif, Sharman Joshi, Gul Panag, Amrita Arora and Isha Kopikkar, has been directed Atul Agnihotri. Chetan is in talks with a few production houses and directors for writing scripts and is also penning a script for director Imtiaz Ali, who directed last year’s hit romantic comedy Jab We Met. "Talks are on for writing a couple of scripts but everything needs to be planned. They are on preliminary stages and I would not like to comment much on it," said the 35-year-old author. Chetan says writing for films is a different experience and he is enjoying it a lot.